There are several sets of frequencies open to license free operation, meaning no license is required. The 49 Mhz frequency range is popular due to the abundance of equipment available in this frequency range. These are typically found in the form of kid's "walkie talkies", although other more professional gear is available. Typical gear available includes both handheld radios and radios worn on your belt with a headset. There are not too many base radios available, although sometimes people will convert old ham equipment to operate here. These sets typically require large antennas. Other users of these frequencies include baby monitors and cordless phones. Power output is limited to 300mw. 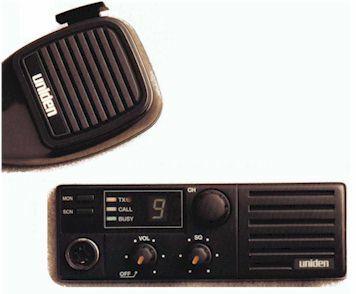 Although there is no such thing as "typical range", these radios have the potential of reaching farther than FRS and 49 mhz due to their 2 watt power limit and the characteristics of VHF signals. There is also no limit on the emission mode of these radios, meaning you can do FM or digital communications. A good source of radios for this band is Ebay. Radio Shack used to sell MURS radios, but I believe they closed them out. FRS frequencies lie in the UHF band. They are low power radios, typically handheld. The price range varies quite a bit from $20 for a low end handheld to well over $150 for the more feature-packed models. The power limit is 500mw, severely limiting the usability of this service. It is mostly used by families, as the name implies. No removable antennas are allowed. There are some base models, which have antennas attached to them. The antennas on the radios are typically small and most FRS radios allow you to select different "Privacy Codes" (aka "PL" or CTCSS) and often come with the ability to "page" another user so they can keep the radio on without hearing everyone talking, until they are needed. Many FRS radio are actually dual-service radios, containing frequencies for both FRS and GMRS. It is important to note that one can only transmit on the FRS frequencies on these radios unless they have a GMRS license (see below). The General Mobile Radio Service is not a "No-License" service, but if you are looking for the ability to talk farther distances, use mobile and base radios, talk through repeaters, and use higher power, but don't want to get an Amateur Radio license, then GMRS might be good for you. The license costs $75 for 5 years. This allows you to use radios up to 50 watts output and you can even access repeaters to increase the range of mobile and handheld units. The FCC only issues GMRS licenses for families. Organizations can no longer get a GMRS license. See the FCC webpage, below, for more info.